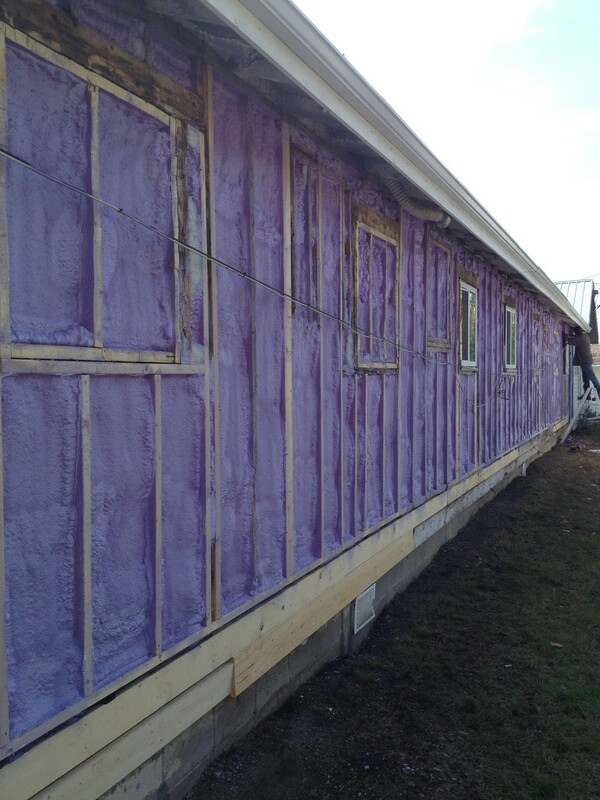 1 Does spray foam insulation require a larger investment than traditional fiberglass insulation? 2 Are there any fire protection requirements? 3 I'm getting spray foam how thick should it be? 4 I have heard that spray foam gives off toxic smoke when it burns, is this true? 5 Can foam be pumped into existing walls? 6 How long does it take to install spray polyurethane insulation? 7 Will spray polyurethane insulation strengthen my house? 8 Can a homeowner apply spray polyurethane insulation? 9 What equipment do I need to apply spray polyurethane insulation? 10 Can spray polyurethane insulation be applied directly to electrical wiring and recessed lights? 11 Will spray polyurethane insulation lose R-value over time? 12 Can I use urethane to insulate an existing home? 13 Wont sealing my house lead to indoor air quality problems? 14 Whats a thermal barrier and when is it needed? 15 What innovative energy saving techniques does spray polyurethane foam allow? 16 How does closed-cell spray foam provide moisture protection, yet still breathe? 17 Which is better, closed or open cell? 18 What is the difference between low density, open cell SPF and medium density closed cell SPF? 19 Is SPF a good soundproofing material? 20 Do you need a vapor retarder or a vapor barrier with SPF insulation? 21 If you spray the underside of a roof deck with SPF insulation, should you vent the attic? 22 What is the difference between a vented and unvented attic? 23 How long has this type of insulation been around? 24 Wouldn't spray-foam insulation seal my house too tight? 25 What kind of Building Professionals endorse foam insulation? 26 What happens if the owners want to add an electrical outlet once the foam insulation is installed? 27 At what stage is the insulation installed? 28 Does the foam create a problem with rodents and insects eating the insulation? 29 How long does Foam Insulation last? 30 Does Foam Insulation support bacteria of fungal growth? 31 Does foam insulation cause any electrical wiring overheat or any problems to metal surfaces? 32 How is the insulation installed? 33 How does Foam Insulation control moisture movement and condensation? 34 How does Foam Insulation control indoor air quality and comfort? 35 Are There Glass Fibers Or Formaldehyde In Spray Foam Insulation? 36 What Are The Advantages Of Spray Foam Insulation? 37 Does Spray Foam Insulation Have Building Code Approvals? 39 How Long Does Spray Foam Last? Does It Change Physically? 40 Does Open Cell Foam Entrap Water? 41 Does Open Cell Soft Foam Absorb Water? 42 How Long Does It Take To Cure? 43 What Is Spray Foam Insulation Made Of? 44 What Are The Advantages Of Foam? 45 Is it possible for a homeowner install this foam on their own? 46 What happens to the shavings of Spray Foam Insulation when trimmed? 47 Will Spray Foam Insulation help with odors within the home? 48 How much does Spray Foam Insulation cost compared to other insulation methods? 49 Ventilation removes moisture, doesn't it? 50 Does Spray Foam Insulation contain urea formaldehyde, CFC's or HCFC's? 51 Are there any compatibility concerns with other building materials? 52 What is the long-term stability of Spray Foam Insulation? 53 What is the cold weather limitation to the application of Spray Foam Insulation? 54 Can Spray Foam Insulation be sprayed directly on a clean and dry ductwork? Is taping required? 55 Will Spray Foam Insulation eventually push out the dry wall? Does it cause dry wall bowing? 56 Does Spray Foam Insulation adhere to metal studs? 57 Can Spray Foam only be used in new construction? 58 How will Spray Foam help me if I only use my home in the winter? 59 How much money can I save? 60 Why does it cost more? 61 How does Spray foam affect my Air Conditioner? 62 Can a homeowner apply polyurethane spray foam insulation themselves? 63 Does polyurethane spray foam insulation have an odor? If so, how long does it last? 64 What is the application process with polyurethane spray foam insulation? 65 Can polyurethane spray foam insulation be applied to foundations? 66 What options do I have if I am renovating and considering polyurethane spray foam insulation? 67 At what point should polyurethane spray foam insulation be applied? 68 What effect does polyurethane spray foam insulation have on the air quality in my house? 69 How does polyurethane spray foam insulation seal my house? 70 Will polyurethane spray foam insulation strengthen my house? 71 What kind of savings will I see using polyurethane spray foam insulation? 72 Does polyurethane spray foam insulation deteriorate over time? 73 Is polyurethane spray foam insulation safe? 74 What is the R-value in open and closed cell polyurethane foam insulation? 75 When would you use open cell polyurethane foam insulation? 76 When would you use closed cell polyurethane foam insulation? 77 What is the difference between open and closed cell polyurethane spray foam insulation?